These two pages are out of the same Yellowstone National Park book published by the Northern Pacific Railroad Company. As they demonstrate, the experience on the train was another selling point to the experience of visiting a National Park. The parks beauty wasn’t the only part of the vacation, the luxury of the train ride another element. Reclining seats might be the standard in today's modern world, but back then it was a luxury that the railroad companies could use to help sell the visit to a park. 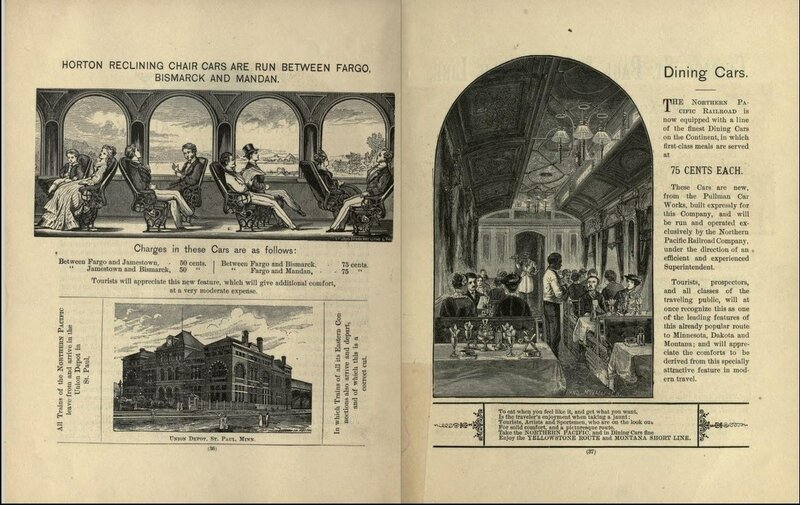 The same can be said with the page on the right: a full dining experience could be included on your ride for 75 cents more. The message is simple: You won’t have to live like you’re in the wild just because you want to visit it.